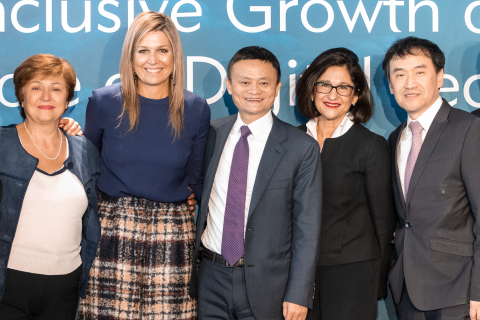 DAVOS, Switzerland--(BUSINESS WIRE)--Luohan Academy – an open research institute initiated by Alibaba Group Holding Limited (NYSE: BABA) – today released its first report examining the oft-debated relationship between digital technology and economic growth at the 2019 World Economic Forum in Davos. The report demonstrates how digital technology can drive inclusive growth in ways previous technology revolutions have not, especially when policies and public-private sector cooperation are supportive. The report was launched at an event co-hosted with the World Bank, and featured speeches and discussions with high-profile experts, including Her Majesty Queen Máxima of the Netherlands and the UN Secretary-General's Special Advocate for Inclusive Finance for Development (UNSGSA); Kristalina Georgieva, CEO of the World Bank; Michael Spence, Professor of Economics at New York University and Nobel Prize Winner; Jack Ma, Alibaba Group Executive Chairman; and Chen Long, Director of Luohan Academy. More than 120 delegates from the World Economic Forum attended the launch event, including government officials, chief executives, academics, and heads of NGOs, international organizations and development agencies. Luohan Academy, an independent think tank and open research institute, was initiated by Alibaba Group on 26th June, 2018 in Hangzhou, China. It was launched by Jack Ma, Alibaba's founder and Executive Chairman, and 16 academic committee members. Luohan Academy intends to bring together the best thinkers in the world with first-hand practical insights into the digital economy in order to advance the research frontiers of digital technology and its impact on humanity. Its mission is two-fold: to understand how digital technology can help achieve common good; and to build a broad research community for systematic and in-depth learning, leading to new paradigms for solving the most pressing issues in digital society.